Michael Nagy, a baritone with Hungarian roots, was initially an ensemble member of the Komische Oper Berlin before moving on to Frankfurt Opera, where he was able to develop his repertoire in leading roles such as Papageno (The Magic Flute), Guglielmo (Così fan tutte), The Count (The Marriage of Figaro), Hans Scholl (Die weiße Rose), Wolfram (Tannhäuser), Valentin (Faust), Prince Yeletsky (Pique Dame), Marcello (La Bohème), Albert (Werther), Frank/Fritz (Die tote Stadt), Jason (Medea), Dr. Falke (Die Fledermaus) and the title role in Owen Wingrave. 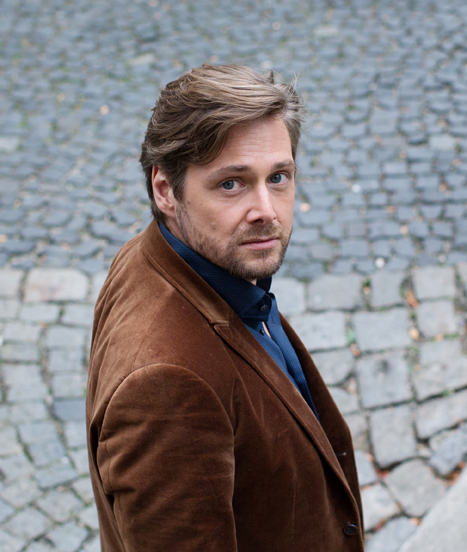 Between 2011 and 2013 he sang the role of Wolfram at the Bayreuth Festival. He appeared as a guest at the Oslo Opera House, Deutsche Oper Berlin, the Bavarian State Opera in Munich, at Zurich Opera House and the Theater an der Wien, among others. In 2013 he performed the role of Papageno (The Magic Flute) with the Berlin Philharmonic Orchestra under the baton of Sir Simon Rattle at the Whitsun Festival in Baden-Baden. In autumn 2014 Michael Nagy made his debut as Eugene Onegin at the Grand Théatre de Genève, and he subsequently reprised this role at the Bavarian State Opera. In Munich he had outstanding success as Stolzius in Andreas Kriegenburg’s new staging of Zimmermann’s Die Soldaten under Kirill Petrenko, hailed as the ’Opera Production of the Year 2014’. The following season saw him in three further role debuts: Hans Heiling in Heinrich Marschner’s eponymous opera at the Theater an der Wien, Kurwenal (Tristan und Isolde) at the Baden-Baden Easter Festival in Mariusz Treliński’s new production, again under Sir Simon Rattle, and the title role in Luigi Dallapiccola’s Il Prigioniero under Thomas Hengelbrock. Guest engagements in the future include Count Almaviva in Le Nozze di Figaro at Zurich Opera House and Marcello (La Bohème), Guglielmo (Così fan tutte) and Papageno (The Magic Flute) at the Bavarian State Opera. Moreover, he will perform the title role in the world premiere of Andreas Lorenzo Scartazzini’s new work Edward II at the Deutsche Oper Berlin.